Vladimir Putin finished his trip to Perm Territory with a working meeting with Acting Governor Maxim Reshetnikov. 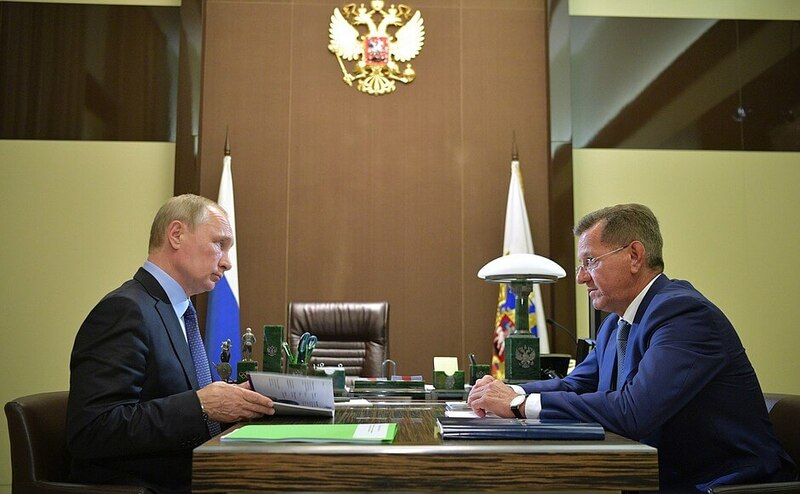 Russian President Vladimir Putin with Acting Governor of Perm Maxim Reshetnikov. Mr. Reshetnikov, how much time has passed since you began? Mr. Putin, it has been seven months, fairly intense ones at that. These months have been busy. During this time, I visited all the 48 districts of the Region. I held meetings with local residents in each district in Perm and worked out a development program. Moreover, the development program was drawn up based on the questions posed by the residents. Actually, citizens of the region do not expect anything from the authorities other than what they can and should provide. Therefore, they raised issues concerning health, education, roads, gasification, communications, the internet, promoting sports and jobs, of course. This is exactly what we can and should provide. We developed a program based on these requests, presented it to the people and discussed it with them. In each district, I tried to visit a central district hospital, a school, agricultural and industrial enterprises. I spoke to war veterans a lot, because, firstly, they have a lot of energy, and secondly, they have a very clear, sensitive take on things, and are very professional too. It really is a great support. And, of course, I talked a lot with young people. Acting Governor of Perm Territory Maxim Reshetnikov. As a result, a program was developed, and there is an understanding of what to do. The program has enough funding for the long term; we analyzed everything so as not to make empty promises. And now there is an understanding of what to do, a team is being formed, and I am sure that we are able to provide what people expect from us, from the region, from the authorities. Mr. Reshetnikov, you are local, you know about everything first-hand, both the strengths and weaknesses. There are still a great many issues to be worked out and solved. You and I have just spoken about it. You are a young man but fairly experienced. You also used to work in the Russian Government. Which department did you work in? I worked in the Department of State Administration, Regional Development and Local Self-government. It dealt with reforms and inter-budgetary relations. And that was when I was Prime Minister. Then you were a Minister in the Moscow Government, which is also considerable experience. It is a megacity of 12 million people. Yet Perm is a special place, a major economic cluster with industry: chemical, petrochemical, you name it, metallurgy. We are now witnessing an IT boom, such interesting professional people; we see how fast it is progressing. There are a lot of things to deal with here, and I would like to wish you success. Thank you for your support and your visit. It matters a lot for the residents here. 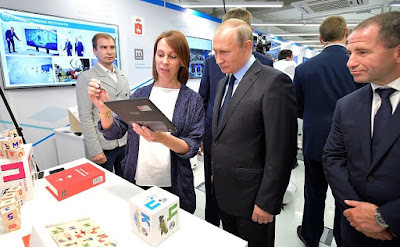 Vladimir Putin visited IT exhibition in Perm, organized by ER-Telecom Holding and learned about Perm’s IT industry products. Vladimir Putin greets robot at the IT exhibition in Perm. 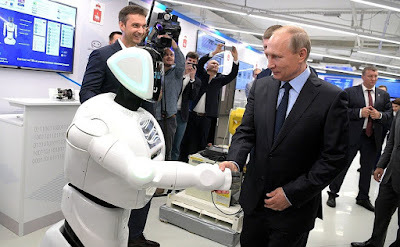 At the exhibition, Russian President Vladimir Putin saw multimedia museum exhibits and a robot that can fill out documents and accept payments. 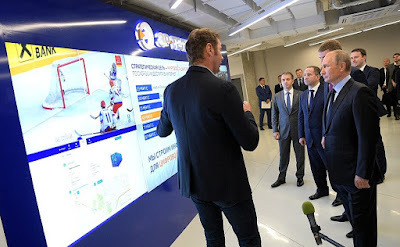 The head of state was told about the idea of public Wi-Fi access, which is already available in central Moscow and St Petersburg, as well as about software developed in Perm for the analysis of public procurement and a blockchain system to organize tenders. This modern technology will help accelerate and automate the process and connect its participants. 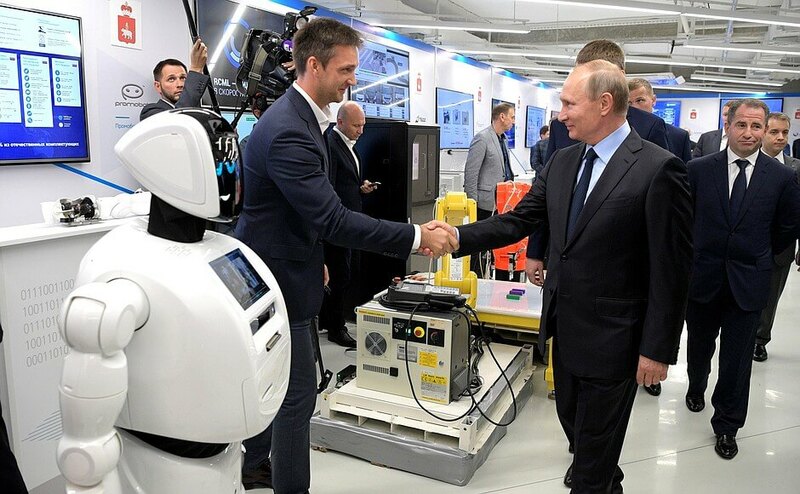 Vladimir Putin visited Perm IT cluster exhibition. ER-Telecom Holding is a national operator of information and communication services in Russia. The company was established in 2001 in Perm in order to provide city residents with modern, fast and high-quality telecommunication services: high-speed internet connection, cable TV and telephone. ER-Telecom currently operates in 566 localities of Russia on the basis of its own telecommunications networks. These networks were built from scratch according to unified standards under the Fiber To Home technology and radio access. As for the number of clients, the company ranks second among the largest internet providers and cable TV operators in Russia. The ER-Telecom optical network is one of the longest in the Russian Federation, covering the two-thirds of the country's territory, serving more than 11 million households. Vladimir Putin visited the company ER-Telecom Holding and learned about Perm’s IT industry products. 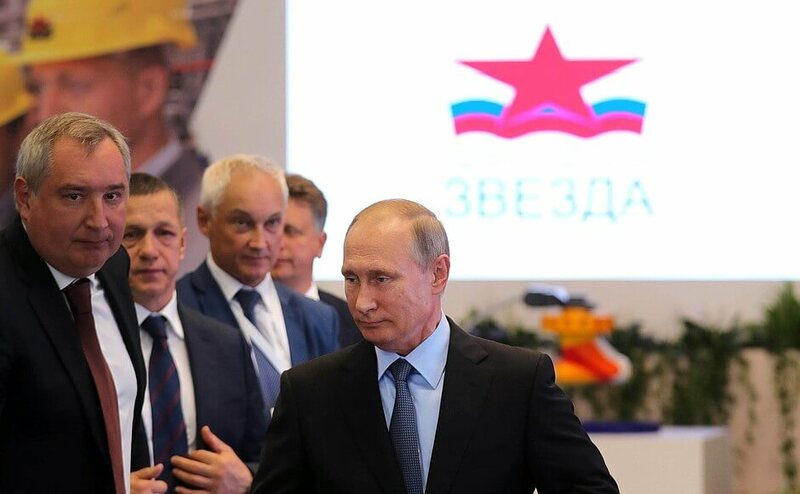 Vladimir Putin at the ER-Telecom Holding IT exhibition. Vladimir Putin watching IT exhibition, organized by ER-Telecom Holding in Perm. 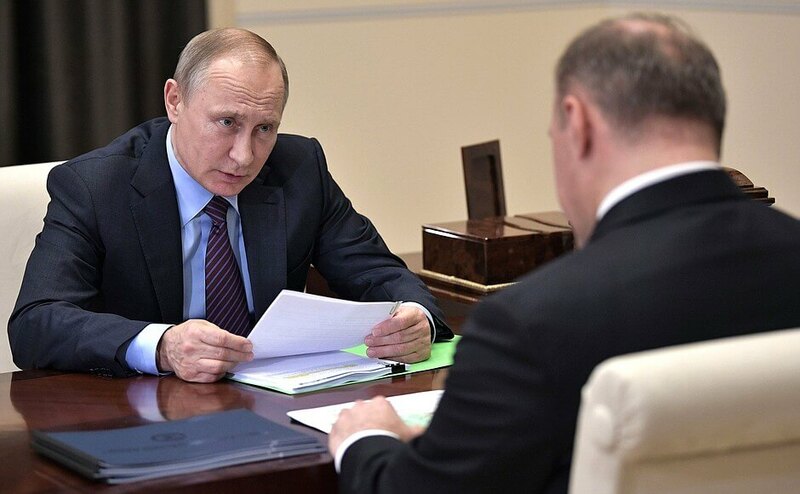 President Putin reviewed Perm improvement plans. Vladimir Putin inspected the city embankment of the Kama and reviewed plans for its modernization during his trip to Perm. 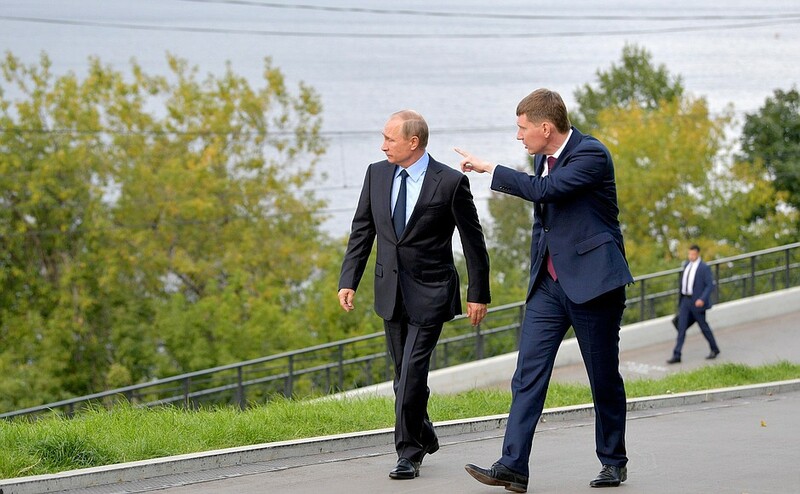 Vladimir Putin toured the embankment of the Kama River and reviewed plans for the modernization of the urban space. With Perm Territory Acting Governor Maxim Reshetnikov. 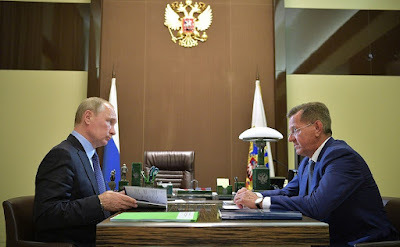 Acting Governor of Perm Territory Maxim Reshetnikov told Vladimir Putin about plans for a large-scale modernization of urban space. So far, only two kilometers out of 70 of the city’s Kama River embankment have been modernized. The rest is occupied by industrial plants and a railway. The city government has proposed dismantling the railway line to create a new urban space and improve the embankment in preparation for the 300th anniversary of Perm to be marked in 2023. Cargo transit will be redirected to a parallel rail line on the other side of the river. A tram will be launched in the vacated area. The authorities also plan to place a local history museum and the Perm Art Gallery on the updated embankment. The historical buildings of the river station and the Perm-1 railway station will house the Russia Is My History exhibition. A building housing the second stage of the Opera and Ballet Theatre may also be built there. Arrival in Perm. 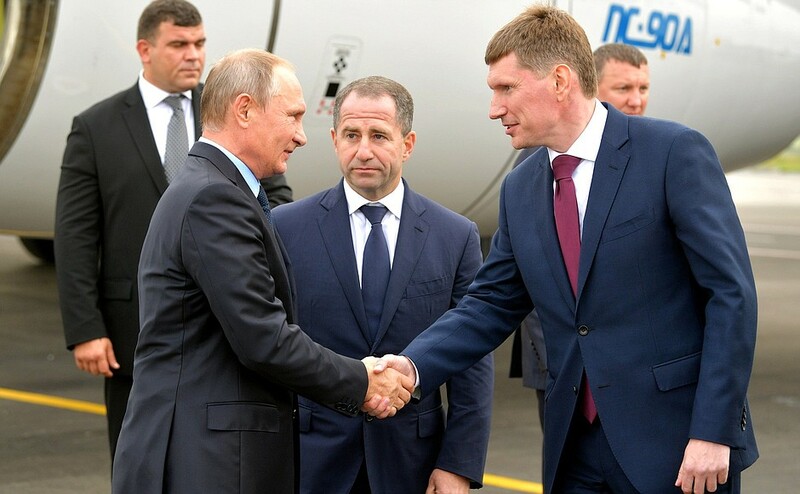 Vladimir Putin with Perm Territory Acting Governor Maxim Reshetnikov, right, and Presidential Plenipotentiary Envoy to the Volga Federal District Mikhail Babich. The modernization plan also calls for installing a flight of steps leading down to the riverbank in another location, the esplanade, where key cultural events take place. At the third site, where the Perm-2 station and the university are located, they plan to alter the grid of city blocks. The authorities propose to use the vacated area for youth educational, sports and leisure infrastructure facilities. This can also be the location of a convention hall and a multi-purpose sports arena. 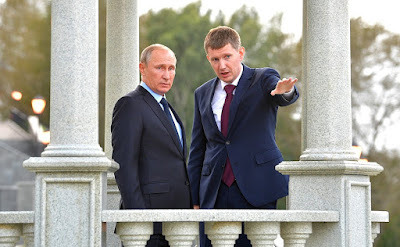 Vladimir Putin with Perm Territory Acting Governor Maxim Reshetnikov. The Perm authorities have already begun modernizing transport infrastructure at the railway station, where a modern interchange hub is under construction. Vladimir Putin and Perm Territory Acting Governor Maxim Reshetnikov on the Kama river. 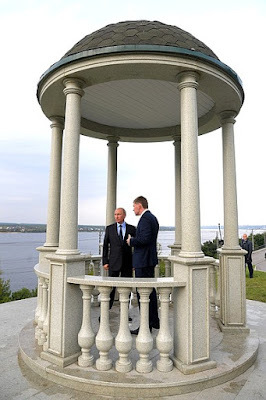 Vladimir Putin toured the embankment of the Kama River and reviewed plans for the modernization of the urban space. Vladimir Putin in Perm on the Kama River. Vladimir Putin visited the Zvezda shipyard in Bolshoi Kamen, concluding his trip to the Far East. 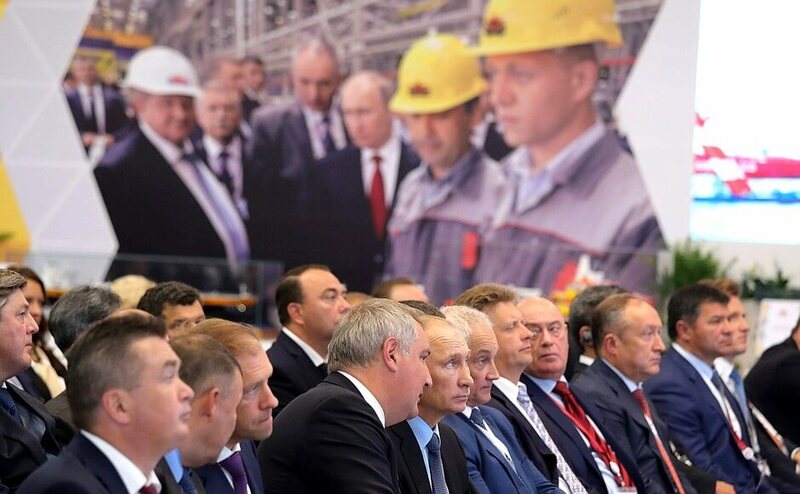 Vladimir Putin took part in the keel laying ceremony. The first Russian dockyard producing large-capacity vessels with an annual capacity of 330,000 tons is being built at the Zvezda shipyard. In the next few years, a commercial shipyard will open here that will manufacture medium and large-capacity vessels and marine equipment, including tankers, gas carriers, elements of drilling platforms, support and seismic survey vessels. 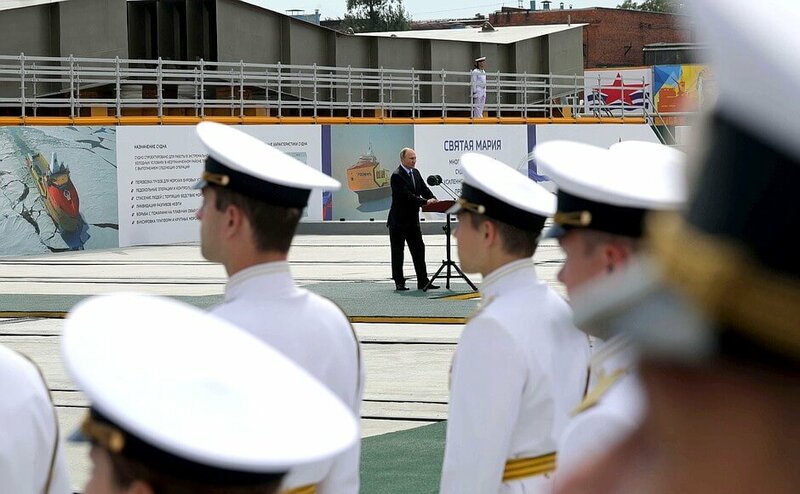 During his visit to the shipyard, President Putin took part in the keel laying ceremony for the Vladimir Monomakh, Alexander Nevsky, Yekaterina Velikaya and Svyataya Maria multi-purpose high ice class supply vessels, which will be built here for Rosneft. A year ago, we met here at the Zvezda shipyard, which was under construction at the time, and inspected its new facilities together. I am happy to see – and I know what is going on here since have I followed the progress closely – that this large-scale project, which is important for the entire country, is developing at a good pace. Almost all work is proceeding in accordance with the schedule. Most importantly, the construction of ships and marine equipment has already begun. 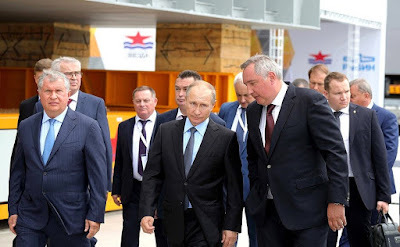 Vladimir Putin visited Zvezda shipyard. I would like to congratulate you on a major landmark: four high ice class supply vessels have been laid down. Commissioned by Rosneft, they will strengthen the company’s potential and that of the entire national fuel and energy sector, as well as promote the development of the Northern Sea Route, a highly important project for the entire country. 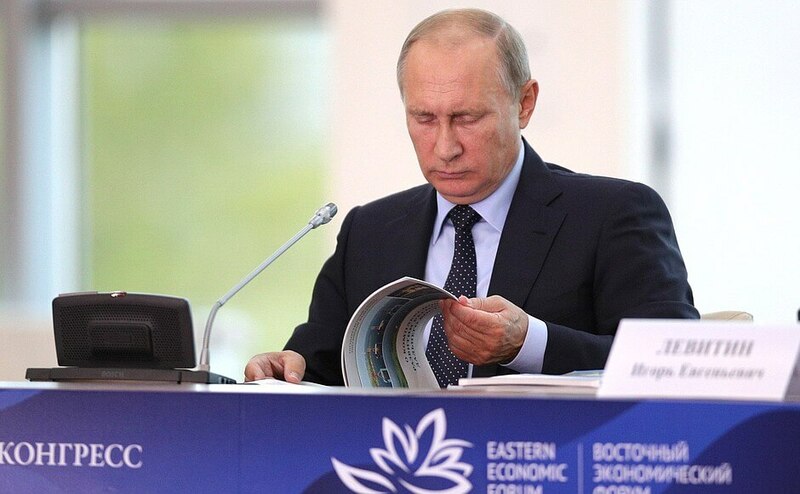 And not only for our country – you may have watched, followed the Eastern Economic Forum in Vladivostok: virtually all countries in the region have shown an interest in it. Today, it is important to start accomplishing the main long-term strategic task and to launch production of full-fledged medium and large capacity vessels and marine technology as soon as possible. I know that a long-term plan for utilizing the enterprise’s production facilities up to 2035 has already been approved. I hope that this plan will be implemented. In fact, I will monitor this project closely because it is probably a key precondition for the enterprise’s success. Not only Rosneft but also Gazprom, Novatek and other Russian companies must put this plan into practice and place orders on time. Maybe, they should submit even more orders because Zvezda certainly has the potential for handling more orders than provided for in this plan. I would like to note that all the principal clients ordering vessels must submit technical specifications for the required products on time. Vladimir Putin during a visit to Zvezda shipyard. I am confident that the company’s staff, you and your colleagues comprehend the scale and importance of our tasks, and that you will do everything possible to establish a competitive shipbuilding center capable of manufacturing modern and highly popular products. Zvezda is sure to join the list of leading shipyards in Russia and internationally. I would like to thank the management and all Zvezda employees for their conscientious work, for their achievements, and I wish all of you, all your colleagues and partners, including foreign and Russian colleagues and partners, every success and all the best. Thank you very much, and I wish you good luck. Vladimir Putin with Deputy Prime Minister Dmitry Rogozin and Rosneft CEO Igor Sechin, left, at Zvezda shipyard. 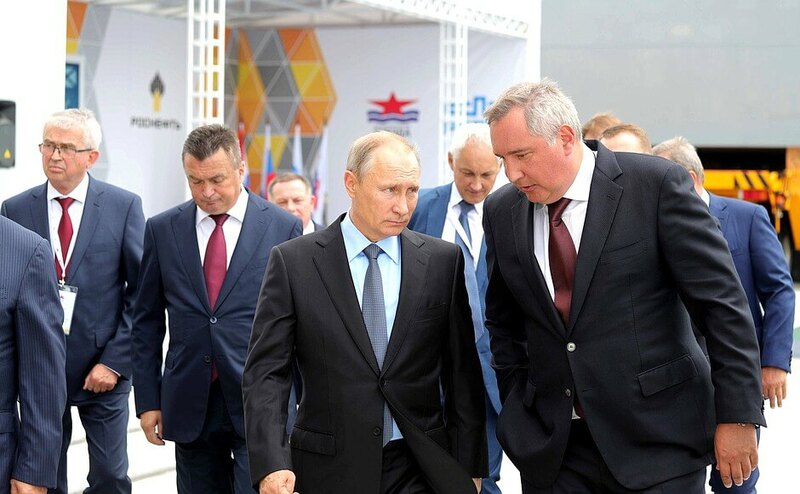 Vladimir Putin with Deputy Prime Minister Dmitry Rogozin at Zvezda shipyard. Speech of Vladimir Putin at a keel laying ceremony for the Vladimir Monomakh, Alexander Nevsky, Yekaterina Velikaya and Svyataya Maria multi-purpose high ice class supply vessels during a visit to Zvezda shipyard. 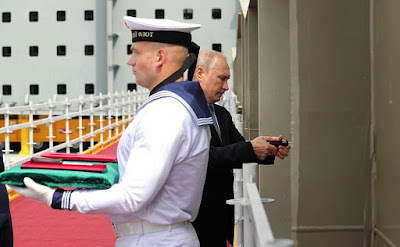 Russian President during a visit to Zvezda shipyard. Vladimir Putin at the State Council Presidium meeting on the comprehensive development of the Russian Far East. The State Council Presidium is holding today’s meeting within the framework of the Eastern Economic Forum. We will discuss the comprehensive development of the Russian Far East and creating conditions for attaining quality improvements that will be obvious to everyone in all Far Eastern regions by the middle of the next decade. We have adopted a decision on a large-scale progressive modernization and development of the Far East. It is clear that we could not make up for the decades of unresolved problems within a matter of the past few years. Frankly speaking, when I look at what is being done now I sometimes feel that we are not doing enough, because we want to see the results of more effective work sooner, we want all of us to work more effectively. But I understand that everything we are doing will take a long time to complete, that these projects cannot be implemented as simply and quickly as we would like to. Of course, there are also positive changes, and quite a lot has been accomplished already. We have created special development institutions and the legal framework for the operation of priority development areas and the Free Port of Vladivostok. We have launched the One Hectare program in the Far East and large infrastructure and industrial projects, which have produced the first results. For example, industrial growth rates are higher in this macro-region than the country’s average. The past three years were far from simple for the Russian economy, yet the average growth rate [here] is 8.6 percent. This is much higher than elsewhere in the country. We have already learned how to attract investments to the Far East, and this work will certainly continue. Now the main task is to raise the people’s standard of living. It should not only reach the nationwide average, but even exceed it in the future. It is vitally important to achieve positive changes that people living in the Far Eastern regions will really feel. In the past 25 years, almost 2 million people have left the macro region. Today, the migration situation is slightly better, but the population continues to decline yearly, not at the same pace as before, but it is still declining by some 0.3 percent. Our main task is to increase the attractiveness of the Far East. This means decent housing, quality healthcare, transport accessibility, modern schools, kindergartens and day nurseries. In short, it is necessary to create conditions so that more hardworking, talented and educated people will come here. The solution of both economic and social tasks can be successful only with the comprehensive development of all nine Far Eastern regions. The Government is developing jointly with the regions draft projects through 2025 for each of these regions. This is a very important stage, when everything needs to be carefully thought through and calculated. Meanwhile, problems are now arising both at the level of the federal budget and at the level of individual agencies. We know that due to various objective reasons we have not been able to fulfil everything that we were going to do to finance the Far Eastern projects – I mean the federal budget. Although the work is going quite well there on the whole. I would like to draw the attention of the Government, the economic bloc, the Economic Development Ministry and the Finance Ministry, to the fact that the Far East continues to remain our priority. Let's remember that. I would ask you to promptly make the necessary adjustments and to ensure funding for integrated regional development programs in the future. Let me also remind you about the decision to include designated Far Eastern chapters within the key state programs. I saw a report on the implementation of this decision. It provided a ranking of state programs in terms of their contribution to the development of the Far East. I have to say that in a number of areas the situation is modest, to put it mildly, if not outright dismaying. What is this all about? Who drafted these programs? They were developed by ministries and agencies in charge of specific sectors. Instead of creating special sections on the Far East within the programs, they either failed to mention it or lack substance. Listen, here is what I want to say to my colleagues in the Government: I will look very closely into this issue, mark my word, and I want everyone to understand that appropriate measures will be taken against those who fail to deliver. We will have to appoint people to those ministries and agencies who understand our country’s development priorities. Please keep this in mind and make sure you address this situation. Moving on, we have here with us heads of companies that invest in the development of Russia’s Far East. I would like to hear from you, colleagues, whether the current federal and regional support mechanisms are effective and to what extent. I think that we need to set a specific objective: in the next three years, all Far Eastern regions should be in the top half of the national ranking of regions in terms of their business climate. What this means is that the Far East should outperform other regions in terms of promoting positive change. Other regions will also seek to improve their standing. Of course, we must keep this in mind. I would like to highlight a sensitive issue for many entrepreneurs in the Far East and across Russia. I am referring to excessive oversight and control. We discuss all the time the issue of inspections being held without any reason or justification. Vladimir Putin during State Council Presidium meeting. 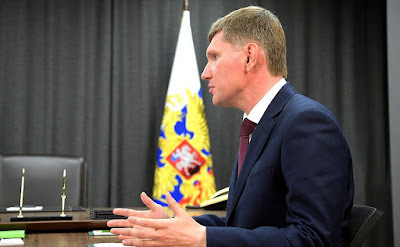 In August, in Blagoveshchensk I instructed the Russian Government, the Prosecutor General’s Office and law enforcement agencies to look into this situation one more time in order to put things straight in terms of oversight. I expect a separate report on these efforts. The One Hectare program has proved worthwhile for supporting local businesses and promoting territorial development. Those who have received land under this program have not only launched their own businesses but have united into new populated areas in the Far East for the first times in decades. The federal and regional governments must provide them with financial assistance and help them create communal infrastructure. I also suggest that those who are successfully working and have privatized their plots of land be offered larger plots of land to develop. We should also give our compatriots who settle in the Far East an opportunity to join this program. In general, we must analyze the progress this program is making. As you know, people asked me about this during the Direct Line program and complained about problems and red tape. We must analyze all these questions and come to proper conclusions. Those who come to live here, including those who come from foreign countries, come with the intention to work here and to build strong families with many children. We must certainly support these people. 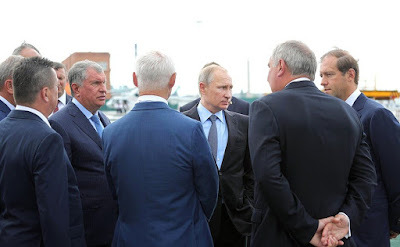 Colleagues, during our meeting in Kaliningrad, where we discussed transport problems in northwest Russia, we agreed to do the same for the Far East. As I have already said, the macro-region’s logistics infrastructure is a key area in the development of Russia’s transport system and international transport corridors. Aviation is crucially important in the Far East. We launched a program of subsidized flights here in 2010. Over the past eight years, the number of subsidized flights has nearly tripled. But this year problems with buying subsidized tickets were reported. Actually, I believe that this happened not only this year. If we look carefully, we will most likely see the same problem last year. I want the Transport Ministry to report on what they plan to do about this problem. We must create conditions in which people living in any part of Russia would feel that they all live in one country. I am not going to formulate solutions right now. I am asking everyone to analyze the situation and submit their proposals. There is also an obvious need for creating more internal routes, which is a separate and very important task. We must think about what we need to do to towards this end. Another question concerns passenger services between the Far Eastern islands and the mainland. This directly concerns the Kamchatka Territory, where aviation is the only means of passenger service available, although there are vast opportunities for using sea routes. Also, I want you to tell me about the implementation of the key infrastructure projects, including the Trans-Siberian and Baikal-Amur mainlines and the development of large sea ports and airports. Proper organization of the checkpoints on the Russian border is of crucial significance. Let us talk about this issue; let us talk about what we are doing in this area. We have made big but so far only the first steps towards the priority development of the Far East. There is hard and responsible work ahead, but we will definitely accomplish it if we act together and implement all our plans without fail. The working group of the State Council has presented a detailed report with many new proposals and has prepared a number of measures related to the comprehensive development of the Far East. Let us discuss it. Mr. Shport, you have the floor. First of all, I would like to thank you, Mr. Putin, for your trust and the opportunity to prepare the working group’s report on the comprehensive development of the Far East. In 2013, you described the development of the Far East as a national project of the 21st century. As per your instructions, we have quickly started creating a model of priority economic development of a macro region that is completely new to Russia. This model is based on the creation of an investment climate and investment systems in the Far East that will be competitive in the whole of Asia Pacific. The new development mechanisms, which we created for a macro region, are truly working. State Council Presidium meeting on the comprehensive development of the Russian Far East. The first resolutions on priority socioeconomic development areas were adopted about two years ago. In terms of technology, this is not a long time, but 18 such zones have already been created in the Far East and 158 companies with 500 billion rubles of reported investment have received resident status. Overall, there are plans to implement 340 projects worth 1.4 trillion rubles. The Vladivostok Free Port’s regime applies to five regions; 284 projects with a total investment of over 320 billion rubles have received Free Port resident status. Infrastructure support is being provided for large investment projects. Federal support, estimated at 34 billion rubles, has been approved for 14 projects in five regions of the Far Eastern Federal District. Mr. Putin, the decisions to level energy rates for companies in the Far East became effective in July, as per your instructions. Arrival of investors is the best indicator of our system-wide work. According to statistics, the real investment rate index in the first half of this year was almost 120 percent and is one of the highest rates in the country. At the working group’s meetings, we carried out a detailed analysis of the situation in existing and future development areas in the Far East. Working group members and the organizations involved submitted over 300 proposals. We have analyzed all of them, and the majority of these proposals have been incorporated in the consolidated report. I would like to say a few words about the working group’s main conclusions and proposals. As you said, much has been done to attract investment to the Far East, but investors have already pointed out new challenges: how to attract skilled workers, and how to keep them in the Far East. The current residents in the priority socioeconomic development areas and at the Free Port have created 60,000 new jobs. All the proposed investment projects, of which there are over 800, will need more than 100,000 people. This is a large workforce, which we cannot provide even if we forget about the demand for skilled workers in the Far East. This problem is also reflected in the results of the national ranking of the investment appeal of our regions. All Far Eastern regions received an E in the category Quality and Availability of Labor, which is the worst mark. The Republic of Sakha (Yakutia) has a D, which is also a bad mark. In this regard, the working group believes that in order to meet economic development needs, it is necessary to implement a set of measures to stimulate labor migration to the Far East. We propose to update the current federal program, Labor Mobility, for this purpose. The program is still active, but it has been adjusted (there are new proposals) and today it requires simple modernization. We propose to focus this program only on the Far Eastern regions. Today this includes 16 regions in total. to resettle compatriots living abroad, to work out measures to support various categories of immigrants. We have worked on such proposals. 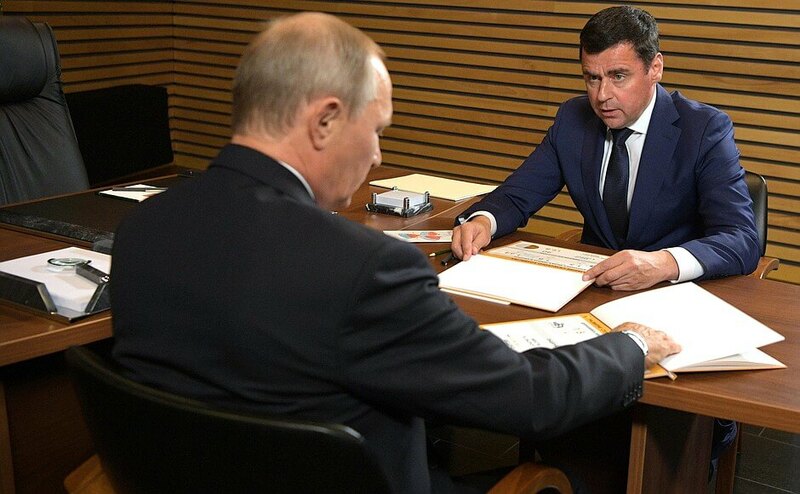 With your approval, Mr. Putin, together with the Ministry of Labor we will develop concrete proposals on the Labor Mobility program. Of course, it is impossible to solve the issue of attracting labor without providing people with certain living conditions. The question arises: how and in what conditions will people live there? So, modern kindergartens, housing, schools, hospitals and sports centers are needed. It is not enough just to stimulate private investment. As you already said, an integrated approach is needed. Before the State Council Presidium meeting on the comprehensive development of the Russian Far East. Thanks to the investment support system, priority development centers are rapidly taking shape in the Far East today. The working group proposes to apply an integrated development approach to them. The first experience with such an approach is underway in the Khabarovsk Territory. 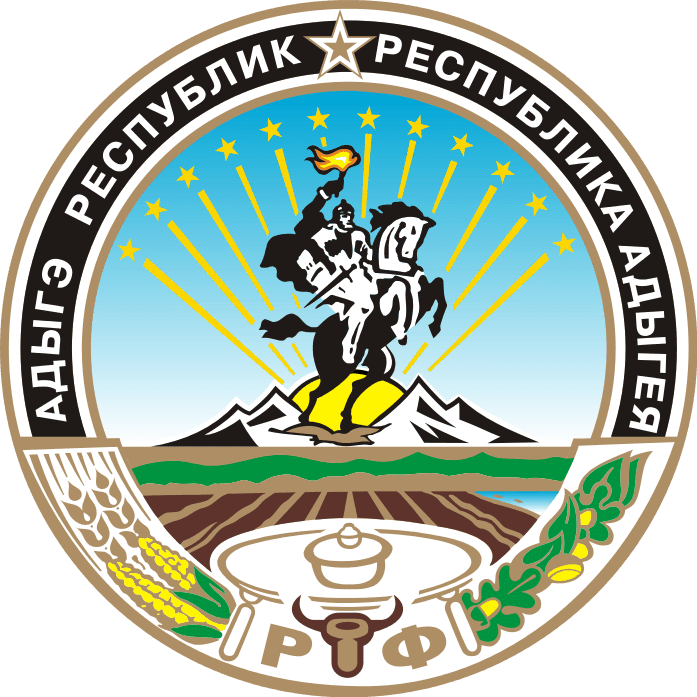 In accordance with your instruction, in April 2016, the Russian Government approved a long-term plan for the comprehensive development of Komsomolsk-on-Amur. I can say that the experience of Komsomolsk-on-Amur will be implemented in Svobodny in the Amur Region soon. In August, the Government approved the integrated plan for Svobodny. The working group proposes to change the mechanism for supporting the integrated development of the Far East. What new approaches are recommended, if you will support them (and we hope you will)? First, in conditions of limited state resources, it is necessary to maintain compact centers of economic growth. Today, there are such centers in almost every region. Together with the Ministry for the Development of the Russian Far East, all the Far Eastern regions have designated such development centers. I can list the main centers: the Eastern Petrochemical Complex in the Primorye Territory, the gas processing center in the Amur Region, the Amuro-Khinganskaya priority development area in the Jewish Autonomous Area, the coal and metallurgical complex in South Yakutia, the Komsomolsk-Amursk-Solnechny agglomeration, the Yuzhny priority development area in the Sakhalin Region, the Avachinskaya agglomeration in the Kamchatka Territory, the gold mining center in the Magadan Region, and Beringovsky priority development area in Chukotka. This approach – through development centers – is distinguished by its cost effectiveness. Here is what I can say about the Khabarovsk Territory. 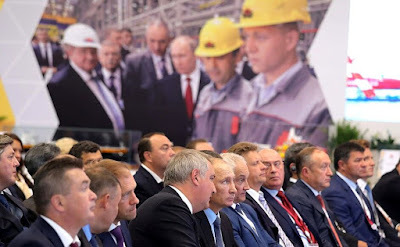 If we act according to sectorial provision standards and open up, figuratively speaking, a broad development front, then the cost of infrastructure will amount to a trillion rubles. But this amount is unbearable, unrealistic. On the other hand, the approach with development center, which we chose, requires 50 billion, and it solves major problems and they are being resolved today, as we can see. We propose approving this approach in all regions. Second, the working group recommends reforming the current rules for granting subsidies to the Far Eastern regions: to move from a multi-channel system of subsidizing regional activities according to sectors to a single grant for integrated development. This will help avoid numerous regulatory procedures for approval. Third, it is proposed to select one main manager of the granted subsidy for integrated development. For Russia, this manager is the Ministry for the Development of the Russian Far East. This will allow us to quickly resolve these issues. According to members of the working group, the subsidy for comprehensive development should not be a substitution for the work with special sections of the Russian Far East in the state programs of the Russian Federation. You have mentioned this as well. This concerns major transport and energy projects, as well as specific ones that are essential for the Russian Far East, such as Seismic Reinforcement of Residential Buildings, a project which is important for most regions. This program is operational in every region and has shown very good results. There are other programs as well, such as Light Aviation Development. This is a separate program, and it should not be discontinued after a single subsidy is introduced. The programs should continue functioning as they are specific and must be included into these special sections. These are our proposals and main areas of focus, which you can find in the report. I would like to thank all members of the working group and colleagues – governors of the Far Eastern regions, investors and public organizations for the energetic work and engaging discussion, and for the proposals that have been submitted to the working group. Mr. Putin, I ask you to support the proposals for the comprehensive development of the Russian Far East voiced here today. 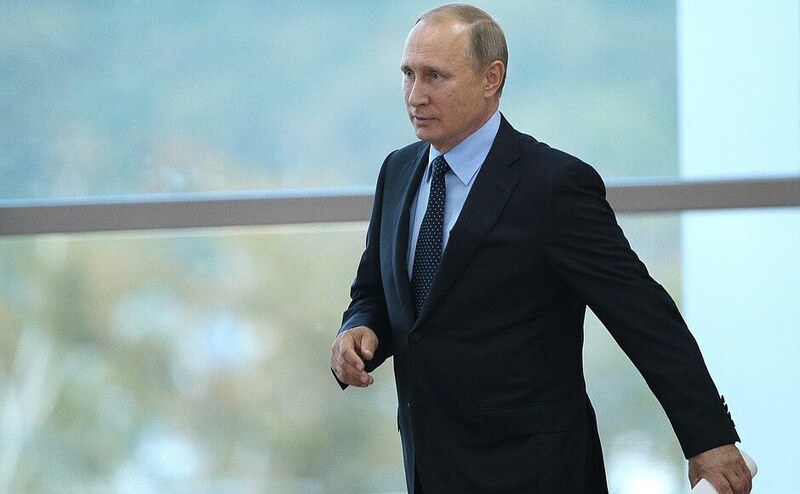 Vladimir Putin before the State Council Presidium meeting on the comprehensive development of the Russian Far East. Thank you very much, Mr. Shport. During the forum, we reported that in the past three years, 837 investment projects have been launched in the Far East with support from the Russian Government. The total amount of investments stands at 3.2 trillion rubles. We can now say that we have learnt to attract investment to the Far East. We are perfectly aware that the world never stops changing, and development models that were created have to be improved. To draw investors there, we have to take some responsibility, primarily responsibility for supporting every project. An essential part of our responsibility is meeting the government’s commitments to build infrastructure for new projects for priority development areas. Currently, work is in progress on 130 such facilities. We are overseeing the construction process online and making sure that every ruble from the budget is spent as designated. There are some problems though. The existing rules on granting subsidies are highly overregulated and do not allow for flexible and efficient management of finances, depending on the schedule of building enterprises. 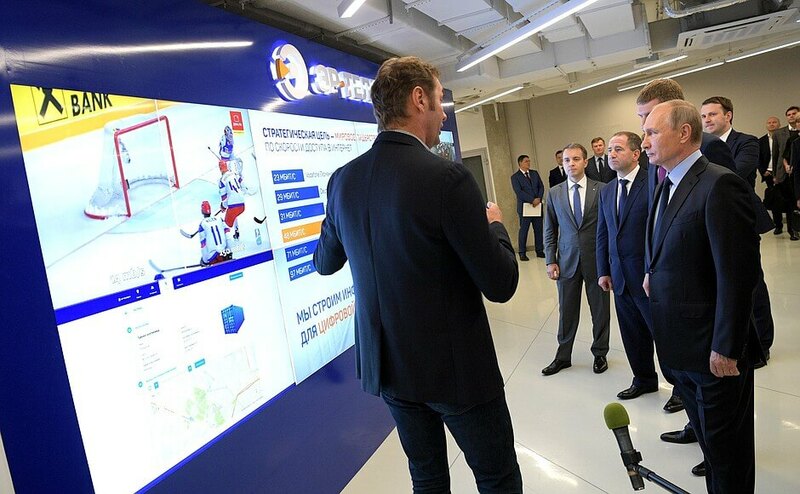 Yesterday, as you were touring the exhibition of priority development areas, you supported the proposal to create multi-functional service centers for investors as well as a change in the rules of subsidizing infrastructure development. We will promptly draft relevant proposals. And yet, we believe that the first stage in the development of the Russian Far East has been a success. Now we are facing even more complicated and larger-scale tasks. First, we should bring living standards in the Russian Far East to a level not lower – and, if possible, higher – than the average living standards in Russia. Second, we should build the required housing, infrastructure, schools, hospitals and kindergartens for all major investment projects. This task is being addressed, Mr. President, as part of your instruction to develop the Zvezda shipbuilding complex: Housing for 7,000 employees is being built; the overall amount of funding is 14.5 billion rubles as provided by the Fund for the Development of the Russian Far East, the Housing Mortgage Finance Agency of the Primorye Territory, and the state program for the development of the Russian Far East. The same comprehensive development task was assigned to the city of Komsomolsk-on-Amur. In that city, we should create 27 municipal infrastructure facilities worth a total of 62.9 billion rubles. But the funding situation is considerably worse, as you noted. In the meantime, we must build highly important facilities, such as a hospital for children, an oncology center, and a theatre. We must also rebuild an engineering school and a sports complex. The city has none of these. We are facing the same problems as we implement the gas refinery project in the town of Svobodny in the Amur Region. This will be a major facility, one of the most advanced in the world, with 4,000 employees. We must provide them with housing, infrastructure and all the necessary services. In effect, we are talking about the need for the Government of the Russian Federation to transition to a project-based way of working, where the state accompanies an investor-implemented project by creating [decent] living conditions for people. Now a few words about solving these problems. In accordance with the President’s instruction, the task of increasing the average Russian level of healthcare, education, culture, sport, housing and transport accessibility in the Far East should be carried out through the prioritization of state programs by relevant ministries. As you already said, this work is organized very differently. The Ministry of Finance, the Ministry of Transport, Rosatom, and the Ministry of Labor envisaged a system of measures to ensure the improvement of living standards for people in the Far East within their competence. At the same time, funding for a number of other programs looks somewhat different: 1.1 percent of the total funding of the state program in agriculture, 0.4 percent in healthcare, 0.3 percent in culture and tourism (tourism is the industry that really should be developed in the Far East), and only 0.1 percent in the protection of the territory and population from emergencies. And this is despite the fact that billions are spent every year from the Reserve Fund of the Russian Government to provide relief following natural disasters in the Far East. It should be noted that the current principle followed when distributing subsidies is a complex mathematical formula that is aimed at levelling things out, but definitely does not provide a way of hitting the targets set for national priorities. Here is what we propose. I think that the percentage of financing of state programs in the Far East cannot be less than the percentage of the total Russian population living in the Far East; today it is 4.2 percent. While you set the goal of accelerated development, we believe that a multiplying coefficient of at least 1.3 may be applied. I propose adopting these requirements in the law on the budget. Our next goal is to carry out the project-based, targeted, and integrated development of the territories. We must build new urban areas, towns, schools, and hospitals in areas with major investment projects. To achieve this goal, the Far Eastern regions and the Ministry for the Development of the Russian Far East developed nine comprehensive plans for developing the Far Eastern regions through 2025. The purpose of the plans is to create competitive living conditions for people in 42 development centers. Mr. Shport has already mentioned this. Creating the necessary social and utility infrastructure for the balanced development of the territory will require 231 billion rubles in 2018–2025, averaging 29 billion rubles a year. I believe that this project can be co-financed with the Russian regions. Pursuant to your decision, the Russian regions, beginning from 2018, will keep the federal portion of the profit tax. These funds were received from the development of the territories and should provide opportunities for further development. Mr. Putin, please instruct the Russian Government to provide sources of financing for the federal portion. We are confident that the integrated development of the territory aimed at creating proper living conditions for employees of new enterprises and all residents of the Russian Far East will make the development process irreversible. Thank you. We will discuss your proposals. Mr. Sokolov, go ahead. As was already mentioned today, the Far Eastern Federal District is strategically important for developing international trade, carrying out industrial and infrastructure projects, and realizing the transit and tourism potential of our country. The district is home to about 90,000 kilometers of motorways and 8,000 kilometers of railways, more than 23,000 kilometers of inland waterways, with 28 sea and 16 river ports, 82 air fields, and 46 border crossing points. The district is also home to international transport corridors which form a single Eurasian space. The transport infrastructure of the region is Russia’s gateway to the Asian transport market, which is the fastest growing market, and this drives the entire economy. The principal objectives of the state and federal targeted program to develop the transport system are cutting the share of transport services, cutting production costs, and increasing the transit and export potential of our country, expanding transport service exports. I would like to point out that while exports of goods and services declined overall last year, the export of transport services did grow, though modestly, to reach around $15 billion. This amounts to almost a half of the country’s natural gas export revenues and is one third more than revenues from coal and ferrous metals export. The basis for the viability and socioeconomic development of the Far Eastern Federal District and its connectedness with the country’s central part is, of course, railway transport. In this area, work is proceeding well on the task you set, Mr. Putin, of modernizing and expanding the capacities of our largest railways – BAM and the Trans-Siberian Railway. The BAM and Trans-Siberian Railway modernization project envisions an increase in cargo delivery from deposits, primarily from the Eastern polygon, towards Far Eastern sea ports and border crossing points to 125 million tons by 2020. This exceeds 2012 benchmark by 66 million tons. Growth last year was about 30 million tons. We expect a further increase of 17 million tons this year. So, next year we will meet the BAM and Trans-Siberian Railway project goals basically ahead of schedule, one year early. 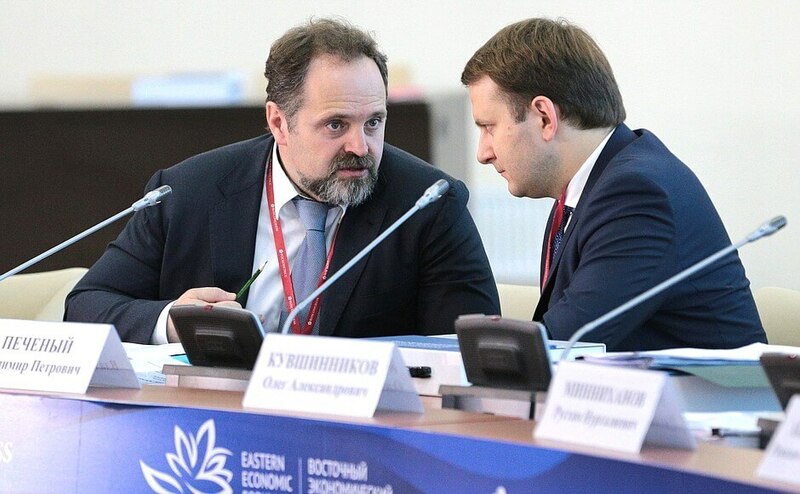 Quite recently at a meeting in the Amur Territory on the implementation of large investment projects in the Far East you tasked us with aligning the BAM and Trans-Siberian Railway development plans with the development plans of cargo shippers and receivers on the territory of the district. I would like to report that freight traffic is continually growing in the eastern direction. According to the largest freight owner company, an increase of coal and ore traffic within the Eastern polygon may reach 140 million tons by 2020. The Eastern polygon has begun operating as a single technological complex this year. A centralized traffic control center was set up in Irkutsk to manage traffic from Kuzbass to Far Eastern ports and border crossing points, a considerable portion of the locomotive fleet has been replaced, traffic intervals have been cut, train speed and weight has gone up, new routes are being made for innovative carriages with increased carrying capacity. The completion of the BAM and Trans-Siberian Railway project on schedule is a key strategic task for us. A few words about international railway projects. Russia and China are building the Nizhneleninskoye-Tongjiang railway bridge under an intergovernmental agreement. The bridge will be part of the transportation system that will connect the Trans-Siberian Railway with the Chinese state railway line via the existing Birobidzhan-Leninsk line. It will be the first railway bridge across the Amur River and the first bridge of this class in the region. This will remove the seasonal factor from cargo deliveries by this route. This project has been estimated at some 10.5 billion rubles. It is being financed by the Russian Direct Investment Fund (RDIF) through investment in the Russia-China Investment Fund, a joint venture between RDIF and the China Investment Corporation, as well as the attraction of borrowed funds. The Russian part of the bridge should be completed in the first half of 2018. The Chinese part has already been completed. The development of the Russian Far East would be impossible without modern port infrastructure. As of early 2017, the capacity of seaports in the Far Eastern Federal District was more than 200 million tons, and there are plans to increase it by 8 million tons by the end of the year. Last year, they handled 186 million tons of cargo. Estimates show that this year they will transship 200 million tons. The seaports’ operation statistics show that the demand for increasing their transshipment capacity will continue to grow, especially the coal transshipment capacity, because coal accounts for about half, actually 45 percent of the total. Coal transshipment figures increased by over 8 percent in the first half of this year. Since the Asian-Pacific countries’ demand for Russian coal is expected to grow, some investors have launched projects to build large-capacity coal terminals at the ports of Vanino, Vostochny and Nakhodka. There are also plans to build coal terminals in Vladivostok and Shakhtersk. By the way, a new coal terminal with a capacity of 18 million tons will open in the port of Vostochny, near Vladivostok, next year. It is also important to maintain regular cargo/passenger marine traffic in the Federal District’s remote and hard to reach regions. The federal targeted program for the development of the Russian Far East stipulated two key projects in this area: a project to upgrade the Vanino and Kholmsk seaport infrastructure for launching a ferry service between mainland Russia and Sakhalin Island and a project to build a ferry passenger pier on the left bank of Anadyr Estuary in the town of Ugolnye Kopi. Two vehicle/rail ferries, now under construction, are to link Sakhalin Island with mainland Russia along the Vanino-Kholmsk line. Per your instruction and the Government directive, we have signed the ferry construction contract with the Amur Shipbuilding Plant, and these ferries have already been laid down. The State Transport Leasing Company and the Foundation for the Development of the Far East will sign an agreement on joint financing of this project tomorrow during the Forum. We are also asking you to support a project to build a cargo/passenger vessel to link the Commander Islands and Severo-Kurilsk with mainland Russia and a project to build a vehicle/passenger ferry to maintain scheduled service between the Kamchatka Peninsula, ports in Sakhalin Island, the Magadan Region, the Primorye Territory and the Kuril Islands. The first project worth 920 million rubles is included in the Federal Targeted Program Transport System Development. The Government first needs to authorize the project; we hope we will receive this, and then we will launch this project before the year is out. No documentation has so far been compiled on the second project. A preliminary design was completed, and we need to find a source of funding for this project, possibly, with due consideration for the federal district’s regions that will be covered by these scheduled services. With due consideration for the Far Eastern Federal District’s extremely remote territories, the local population’s quality of life largely depends on air transport development, primarily domestic air traffic volumes. State support measures for the air transport sector ensured a sustained increase in domestic air traffic volumes. Last year, domestic flights carried 56 million passengers or almost 7.5 percent more on 2015. About 35 million people have flown over the seven months of 2017, and this is 12 percent more than the same period last year. The number of air passengers is growing within the Federal District as well. The combined traffic volume on international and domestic routes has reached 6.5 million passengers, and we expect it to be 7 million by the end of 2017. This year, the Russian Government has allocated almost 7 billion rubles to the Far Eastern Federal District alone to implement subsidy programs and support regional airports that make part of state-run enterprises. The District is implementing three state air subsidy programs. Flights are performed on 68 routes, with about 430,000 passengers taking the flights under the support programs during the first seven months of this year. The total amount of budget allocations for these programs was over 4 billion rubles. This is more than half of the funds, even 55 percent of the funds, set aside for all air subsidy programs on the national scale, which means that over half of the sum was spent in the Far Eastern Federal District. Of course, considerable additional budget allocations – over 2.5 billion rubles – are needed to grant all applications. But the key point and a systemic measure here, as we see it, could be to slash to zero the VAT rate on routes bypassing the Moscow air hub. And this will drive the development of regional aviation. It is also important to note the performance of our national carrier, Aeroflot, which since 2015 has been conveying passengers from Moscow to Vladivostok, Khabarovsk, Yuzhno-Sakhalinsk, Petropavlovsk-Kamchatsky and Magadan based on single, so-called, flat rates indexed only to the actual inflation. Since the start of the federal targeted program for transport system development, we have overhauled the airfield infrastructure at the airports of Nikolayevsk-on-Amur, Yuzhno-Sakhalinsk, Petropavlovsk-Kamchatsky, and, in part, Magadan and Yakutsk. The airfield in Khabarovsk is being rebuilt. Project documentation and specifications have been drafted for the airports of Blagoveshchensk, Zhigansk and Pevek. It is planned to allocate over 16 billion rubles for these projects until 2021. It is also planned to complete the reconstruction projects worth about 18 billion rubles at the airports of Magadan, Yakutsk, Khabarovsk and Blagoveshchensk. Yelizovo Airport in Petropavlovsk-Kamchatsky is among the more important projects being implemented under a public-private partnership plan. Last year, the airport’s infrastructure was upgraded under a 12-billion ruble program. Today, the airport can receive all types of aircraft, up to a Boeing 777. The media reported today that Renova Group, who will invest about 8 billion rubles overall, is planning to build a new airport terminal here by 2021. This facility will include a passenger terminal, a hotel, a shopping mall and an office center. This will allow the airport to handle up to one million passengers. A project for the comprehensive development of Novy Airport is another public-private partnership project. This airport is located in the city of Khabarovsk and can handle up to three million passengers. Foreign investment accounts for about 50 percent or 49 percent, to be more exact. A consortium of major Japanese companies has become interested in it. We have never built such air transport projects in the Far East before, and we hope that this practice will continue in those airports that still lack modern terminals. The important federal highway routes, including Amur, Vilyui, Lena, Ussuri and Kolyma, pass through the federal district. In the past two years, we have built and upgraded over 225 kilometers of these routes. In late 2016, about 55 percent of the district’s federal roads met government standards. This is less than the national average, so we are planning to increase the share to 77 percent before the year is out. And it is to reach 83 percent by late 2018, which will, on the whole, be in line with the national rate. This year, there are plans to open new sections of the Kolyma and Lena roads and to complete a route for accessing the border with China in the Amur Region. We have some wonderful examples of new regional roads. This includes Sakhalin Island. Overall, the situation with the federal district’s regional roads is even better than the national average. The country’s regions should have at least 42 percent of these roads, with the federal district’s regional roads making up about 45 percent. But, of course, we realize that regional and municipal roads should be brought up to the standards. This year, we have already allocated over 12 billion rubles from the federal budget. Additional proposals for 2 billion rubles have been drafted; the Primorye and Khabarovsk territories will receive in the environs of 1.25 billion rubles to participate in the Safe and Quality Roads project. To conclude on the road theme, I would like to say that the public-private partnership is developing in the Russian Far East in this area as well. The 30-kilometre-long Motor Roads in Circumvention of Khabarovsk project is being implemented based on these principles. It will certainly influence transport infrastructure development and territorial connectivity. The total volume of funding is over 42 billion rubles. The federal budget will also support this project to the tune of 19 billion rubles. In conclusion, I would like to say a few words about checkpoints. The District has 46 checkpoints: 11 on routes within the international transport corridors and 18 in the territory of the Free Port of Vladivostok. Starting this year, they participate in the online visa project that facilitates the entry of foreign visitors. As estimated by the Transport Ministry, the condition of the checkpoints is satisfactory in only four cases. Many, regrettably, are in a poor condition. Most of these checkpoints are regional in nature and cater to border cooperation and tourism. We believe that regional agencies and authorities can also foot part of the bill to modernize these border checkpoints, because 41 out of 46 functioning checkpoints are located on private property. There are instances of private owners investing in the checkpoints and we welcome this on the national scale. Mr. President, please support the aforementioned proposals. If possible, they might be reflected on the list of instructions summarizing the results of today’s meeting. I would like to assure you that the Transport Ministry is doing and will continue to do everything for the Russian transport system, including in the Far East, to be one of the main drivers of the economy. Thank you. This concludes my report. Vladimir Putin met with members of the public of the Yaroslavl Region on board the Russia river cruise ship. 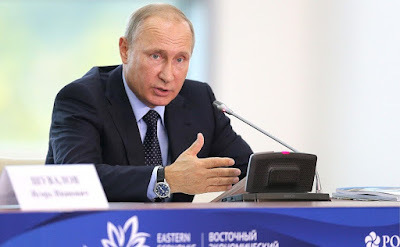 Vladimir Putin at the meeting with members of the public of Yaroslavl Region. 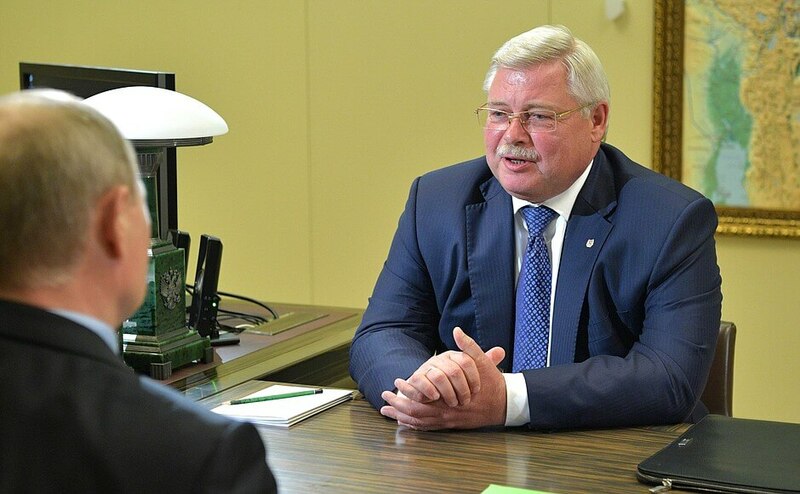 Acting Governor of the Yaroslavl Region Dmitry Mironov also took part in the meeting. 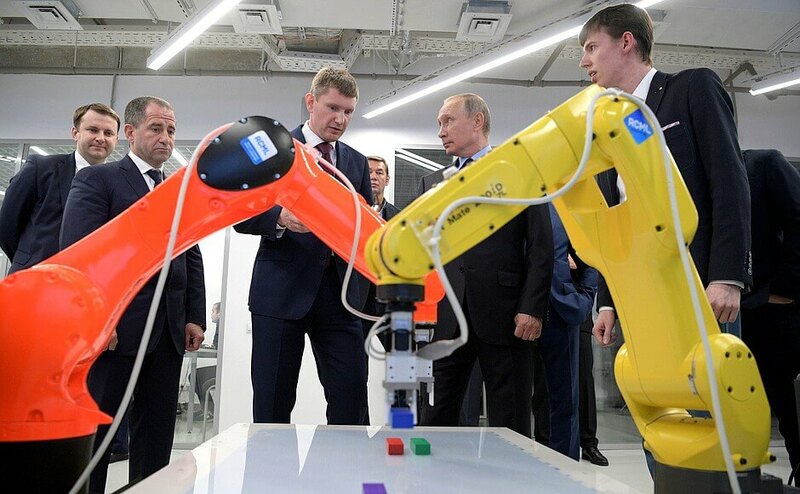 Before the conversation, Vladimir Putin saw the latest product of Yaroslavl’s Paritet company – hydrofoils. 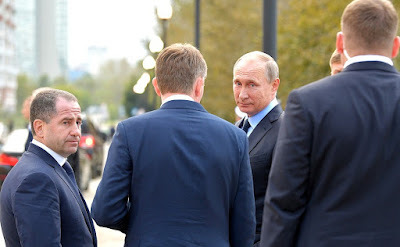 Vladimir Putin at the meeting with Acting Governor of the Yaroslavl Region Dmitry Mironov. Keeping with tradition, Russian President handed over to Dmitry Mironov the "green folder" with complaints sent in by local residents during the Direct Line with the President. The complaints concerned, in particular, the healthcare sector, relocating people from dilapidated housing, provision of gas supply, and timely wage payments. Vladimir Putin had a working meeting with Acting Head of the Republic of Adygeya Murat Kumpilov to discuss the current socioeconomic situation in the republic. Vladimir Putin with Acting Head of the Republic of Adygeya Murat Kumpilov. 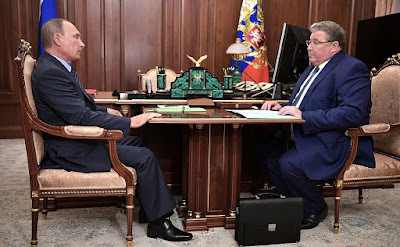 President Putin asked the Head of Adygeya about the complaints sent in by local residents during the Direct Line with the Russian President regarding issues such as resettlement from dilapidated housing and the situation in education and healthcare. Acting Head of the Republic of Mordovia briefed Vladimir Putin on the socioeconomic situation in the region. Vladimir Putin with Acting Head of the Republic of Mordovia Vladimir Volkov. 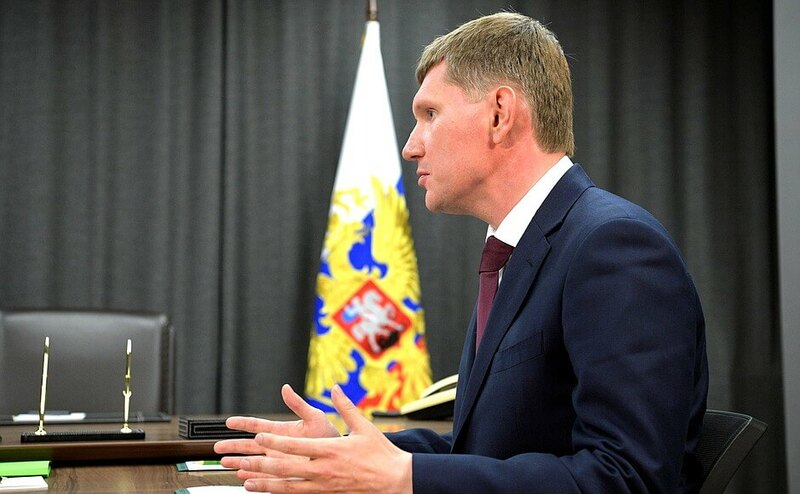 Vladimir Volkov described a number of major agricultural and industrial projects carried out in the region. The requests from Mordovian residents that President Putin received during Direct Line were discussed separately. Vladimir Putin chaired a meeting with Emergencies Minister and heads of states. 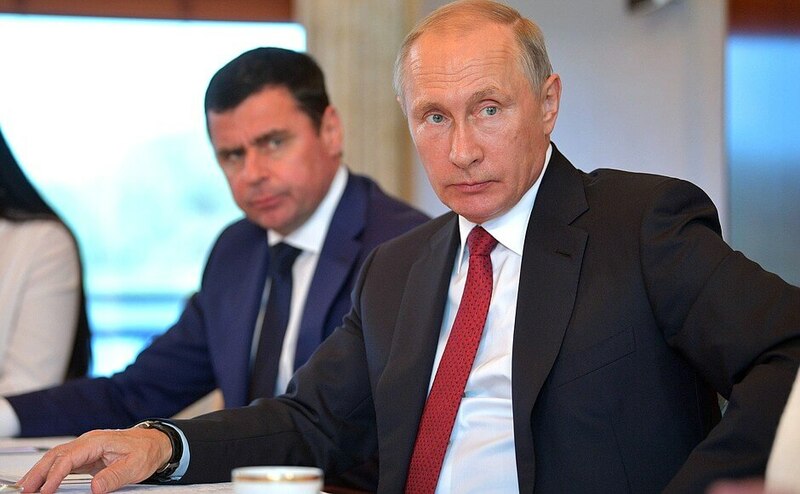 Vladimir Putin held a meeting with Emergencies Minister and heads of Volgograd and Rostov regions on relief measures following wildfires. Emergencies Minister Vladimir Puchkov, Rostov Region Governor Vasily Golubev and Volgograd Region Governor Andrei Bocharov updated Russian President on relief measures that have been taken following the fires. Minister of Civil Defense, Emergencies and Disasters Relief Vladimir Puchkov reported to the President Putin by telephone about the progress being made in fighting wildfires and their consequences in the Volgograd Region and Rostov-on-Don. The Minister did not rule out the possibility of arson. Wildfires in the Volgograd Region and Rostov-on-Don. 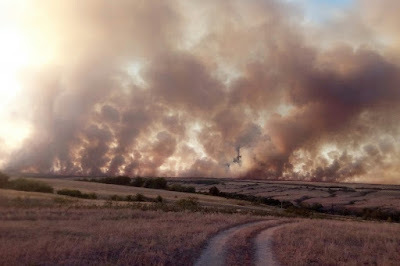 Instructions in connection with wildfires in Rostov-on-Don and Volgograd Region. 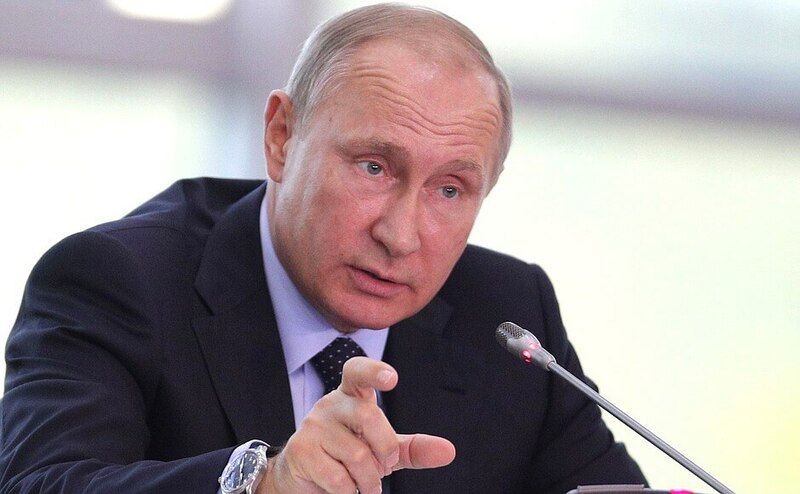 Vladimir Putin instructed the Government to continue rendering all the necessary aid to the victims of the fires and law enforcement agencies to thoroughly investigate the causes of the disaster. A fire that broke out in Rostov-on-Don’s historic center on August 21 destroyed around 120 buildings, some 100 of them being residential premises, and caused one fatality. Vladimir Putin had a meeting with Acting Governor of Ryazan Region Nikolai Lyubimov. Vladimir Putin at a meeting with Acting Governor of Ryazan Region Nikolai Lyubimov. Vladimir Putin discussed with the Acting Governor the complaints that came in from the region’s residents during the Direct Line with the President and the current situation in the region, in particular, the state of roads, transport accessibility, provision of gas supply in rural areas, relocating people from dilapidated housing, and the situation in the region’s healthcare sector. 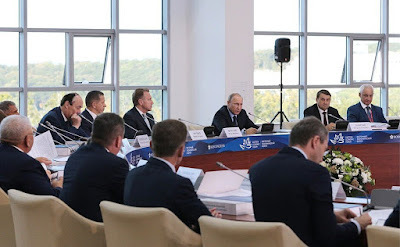 Vladimir Putin held a meeting on measures to develop Russian light industry sector, with particular focus on growth prospects and efforts to fight production of counterfeit goods. At Ryazan Tannery. 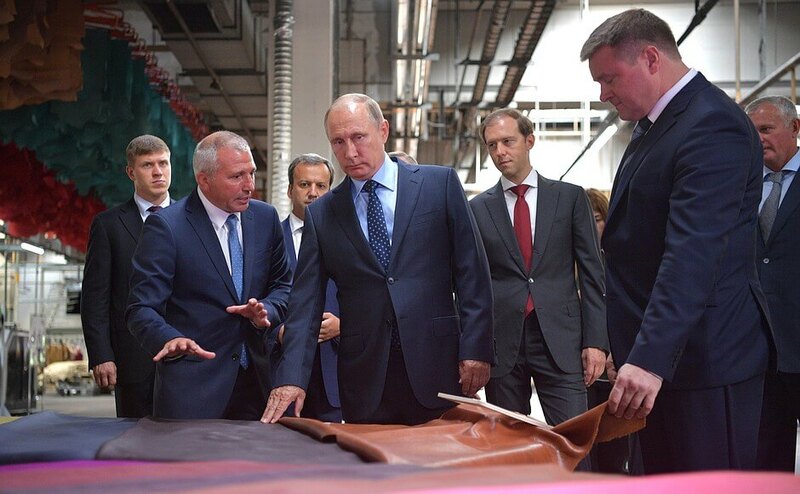 Vladimir Putin got an overview of the company’s main activities. The main speakers at the meeting were Minister of Trade and Industry Denis Manturov, President of the Russian Union of Entrepreneurs of Textile and Light Industry Andrei Razbrodin, and General Director of the Russian Union of Leather Workers and Shoemakers Alexander Andrunakievich. 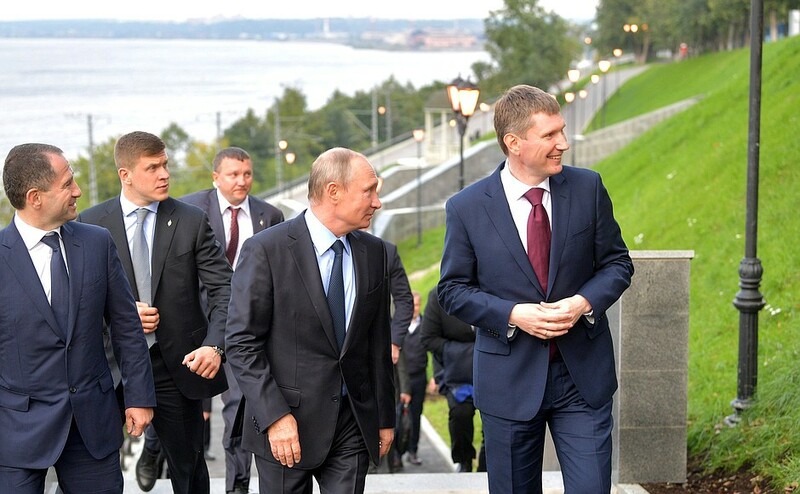 Putin met with Astrakhan Region Governor Alexander Zhilkin. Vladimir Putin with Astrakhan Region Governor Alexander Zhilkin. 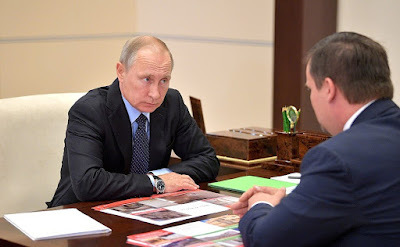 Alexander Zhilkin updated Vladimir Putin on the socioeconomic situation in Astrakhan Region. A separate issue on the meeting agenda concerned requests from the region’s residents submitted during the recent Direct Line with Vladimir Putin. Vladimir Putin nominated candidates to post of Head of Adygeya to Adygeya State Council – Khase for consideration. Emblem of the Republic of Adygeya. 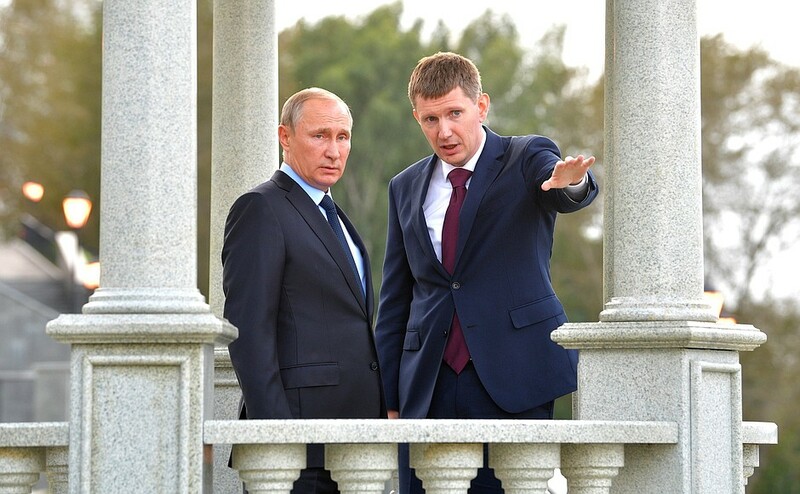 Sergei Zhvachkin briefed Vladimir Putin on the socioeconomic situation in Tomsk Region. 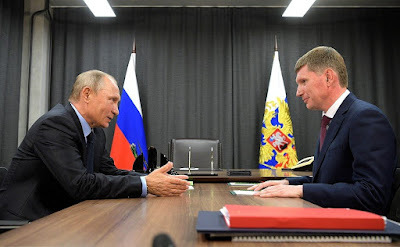 Vladimir Putin had a meeting with acting Governor of Tomsk Region Sergei Zhvachkin. Among the issues discussed at the meeting were complaints from local residents sent in during the Direct Line with the President. Sergei Zhvachkin spoke of the projects in science and innovation, and social sector initiatives implemented in the region. The region has recreated an innovative infrastructure and is developing innovative business.